It is possible to get potable drinking water from air. The technology exists and the device is called an Atmospheric Water Generator (AWG). 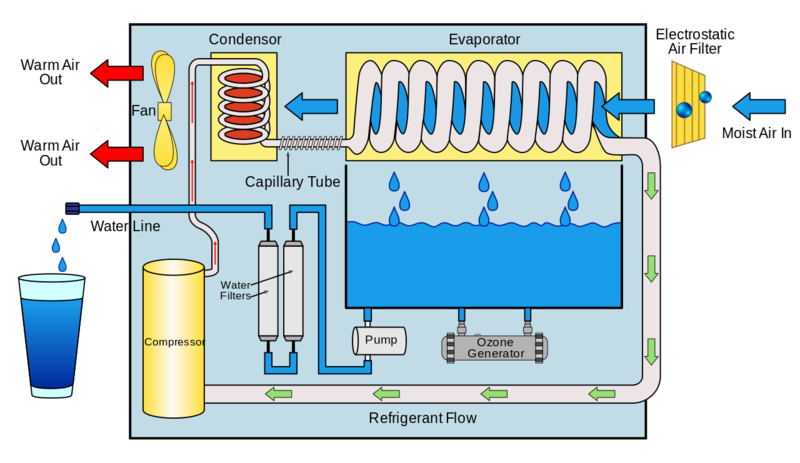 An AWG extracts water from vapor in the air primarily by cooling the air below its dew point (condensation) or by exposing the air to desiccants (substances that attract and hold water molecules from the surrounding environment). This device is similar to a dehumidifier; however an air to water generator is also designed to make the water drinkable. Most AWG's use one or more purification or filtration methods to produce cleaning drinking water. In order to meet the FDA and NSF standards for drinking water, many AWG companies use one or more methods of disinfection and filtration, such as ozonation, UV, RO, or carbon filtration. Most home water generators depend on the right mix of humidity, temperature and altitude, but the technology is advancing, and they have even been able to produce drinking water from air on the desert. In most cases the AWG is plugged in and a coil is cooled so that warm air that passes over it and condenses from vapor to water. The water is then filtered or purified and drips into a holding tank as fresh drinking water. The amount of water that is collected depends on the conditions in the environment. The environmental condition and type of AWG will also determine how energy efficient and cost effective it is to produce the drinking water from air. Even though commercial sized generators do exist, AWGs use a lot of energy to generate water. Thus, at this time it is not the most feasible method for large scale fresh water generation. Desalination plants are a better option. For home drinking water use, the energy usage of home water generator is comparable to a desktop computer system. The energy cost of using a water generator is much less expensive than buying bottled water but much more expensive than using a water filtration system with tap water. I have been researching home water generators for a few years and I haven’t found any that I can really get behind recommending, mainly because of their initial cost, problems with leaking, and relatively limited and slow output compared to home water filtration systems that use tap or well water. In addition, since most AWGs use electricity, they are not considered for emergency water generation. In addition, the amount of water a machine can collect and how energy efficient and cost effective it is depends on the right mix of temperature, altitude and humidity. Even though I like the concept of producing water from air, I believe multi-stage water filter systems for tap or well water is still a better option. However, since only 1% of the earth’s water is available for drinking water and that small percentage is becoming more and more contaminated by the day, I hope that the research continues to develop AWG technology. We may need it in the near future! Robert F. Service; ScienceMag.org: This new solar-powered device can pull water straight from the desert air; April 13, 2017.